The Harry Potter Halloween party we hosted last year was so fun that I plan to make it an annual thing. I’ve been working on the preparations since the summer in the hope that by adding a little each year, sometime in the future I’ll be able to transform our whole home into that of a common wizarding family in the Harry Potter universe. Here is the first post on what I’ve made this year. 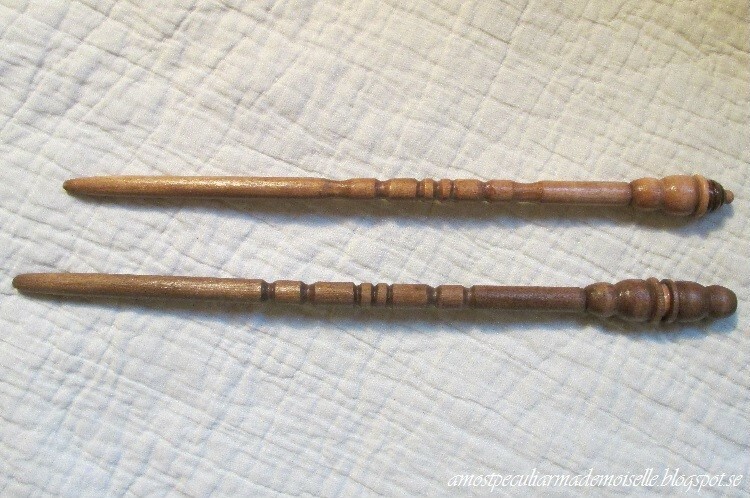 As wands are such basic things for witches and wizards, I wanted hubby and me to have one each, though it’s unlikely we’ll be carrying them with us very much at the party. I tried the hot-glue-on-a-stick method, but didn’t like it much. 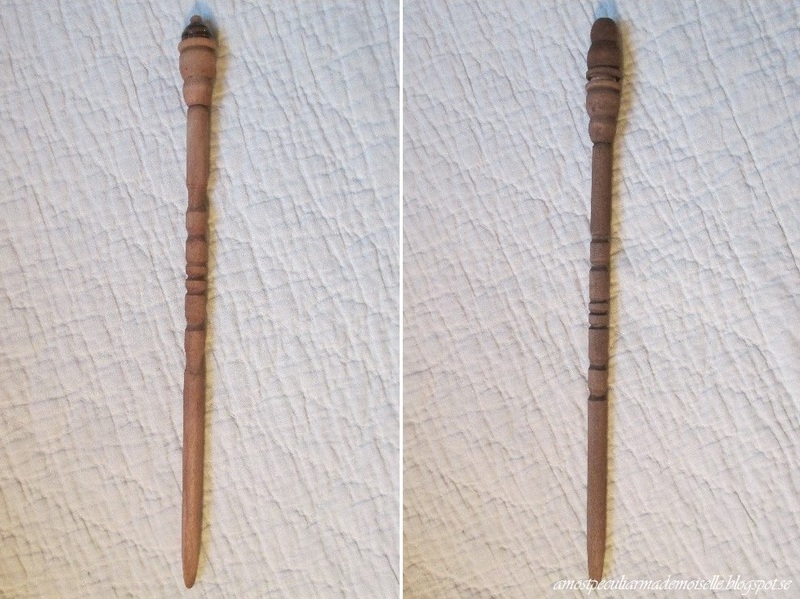 I wanted neater wands, made from real wood. I got wooden dowels (10 millimetre diameter) from the local craft store, and as they were too short to make nice wands on their own, I searched my stash of craft supplies for the other things I needed. I found wooden beads and other turned wood shapes – if anyone have a good name for them, please share. I meant to assemble these different elements with a combination of screws and glue. First I played around with the materials a bit, deciding how I wanted our wands to look. 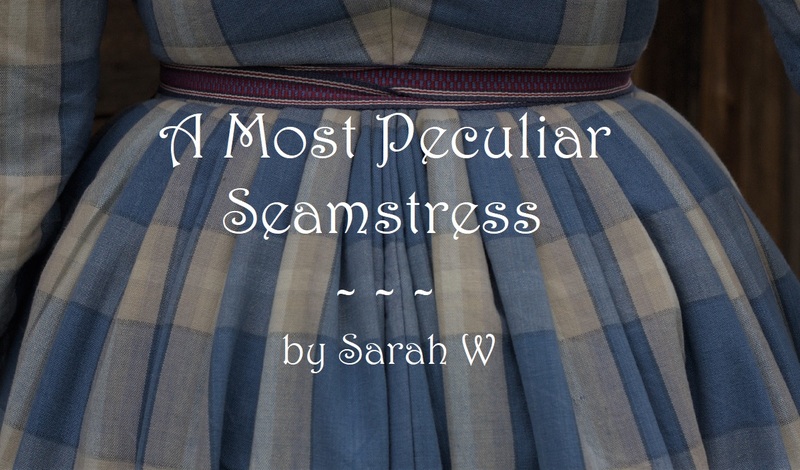 I didn’t want them to look identical, but a as I had a limited choice of materials, I had to work with what I had. I decided that the wand with the larger handle would be hubby’s, as he has larger hands than me. I also chose wooden beads of different colours, as I thought that could be a nice touch. After I had decided on the basic design, I whittled patterns on the dowels. They are similar, but not identical. As I’ve said before, I’m not very good with woodwork, but all in all, I’m happy with how these turned out. After the carving was done it was time for sanding. I used round objects of different diameters (knitting needles and a round building block borrowed from the kids) to wrap the sandpaper round, to help get a nice, even finish to the carved areas. 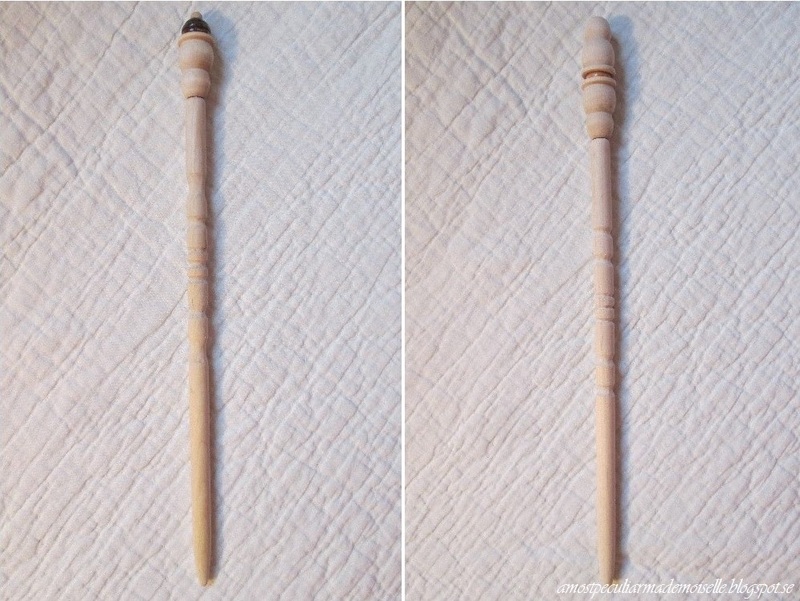 I also sanded the dowels to taper towards the tip, and made mine a smidge thinner than hubby’s, for a more feminine look. Unfortunately I only remembered to take a picture of one of the dowels at this step. I drilled holes in the “handle” ends, and drilled corresponding holes in the turned-wood-things. 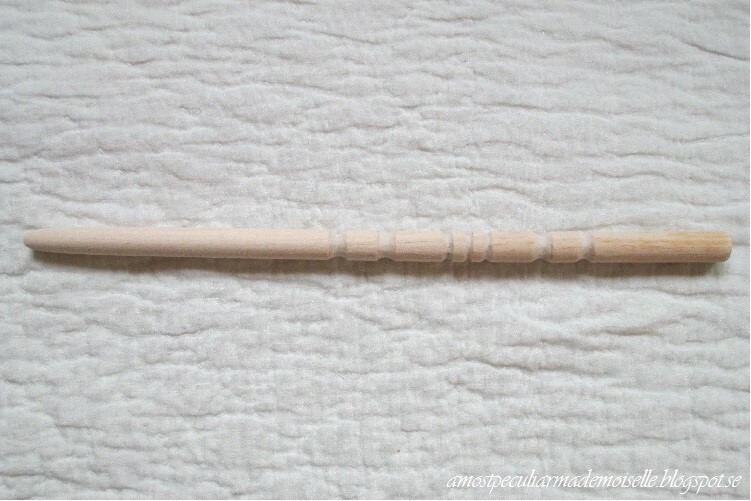 With a screw I then attached the wooden bead and the turned-wood-thing to the dowel of what would become hubby’s wand, adding a bit of hot glue for strength. I would have preferred wood glue for this, but we didn’t have any. With hot glue I attached the other turned-wood-thing, and the first wand was assembled. 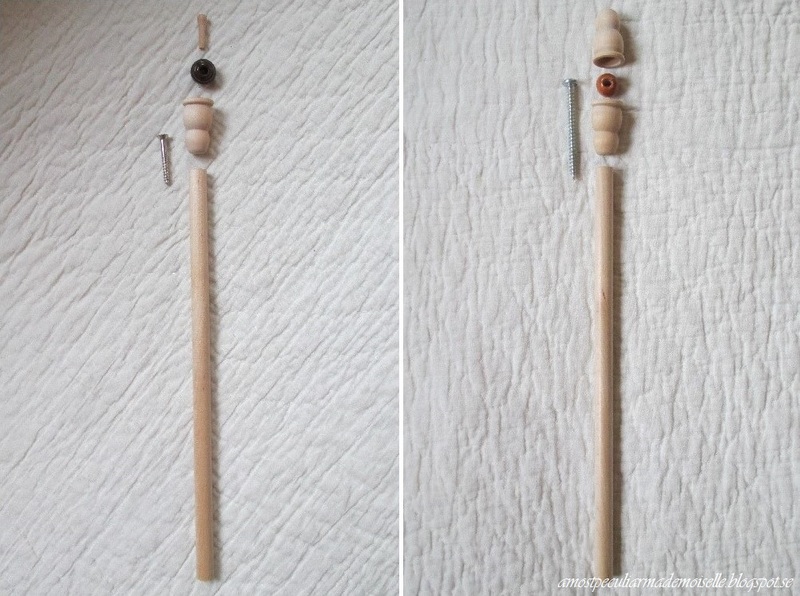 For mine, I screwed the turned wood thing to the dowel, again securing it with hot glue, and then added the bead and small peg with more hot glue. After that I painted the wands with acrylic paint that I had diluted with water for more of a stained than painted effect. When they had dried I sealed them with two coats of a semi glossy varnish. Ta-da! The different coloured beads worked out well, especially as I painted the wands in shades to compliment them. 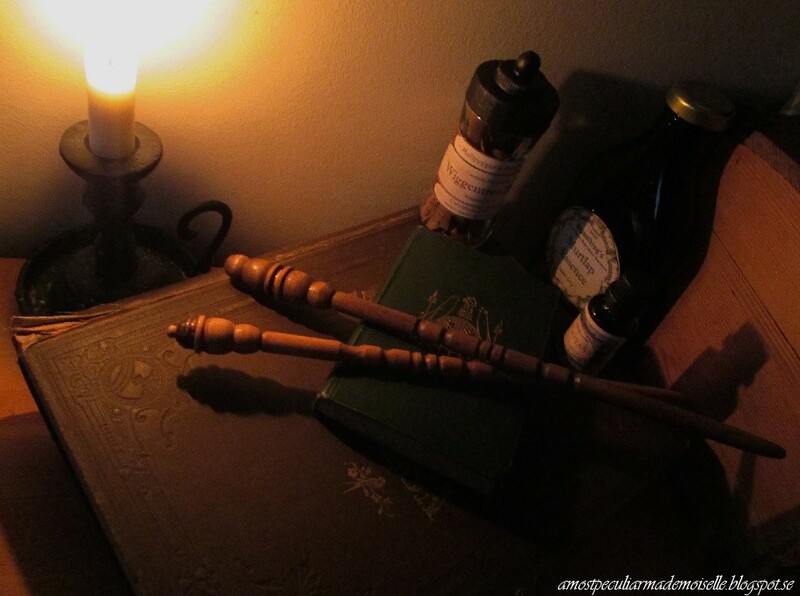 The finished wands are rather pretty, and comfortable to handle – a very important feature, I would think, for objects that are allegedly used countless times every day, and are always within reach of their owners. 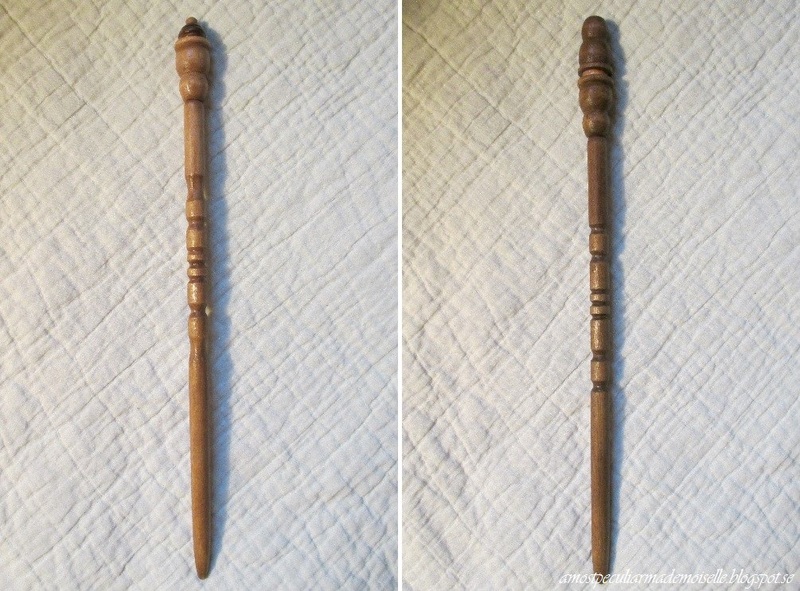 Hubby’s wand is 12 5/8″ long and mine is 11 3/4″. What wood type and core they are supposed to be made from is still undetermined. Sometime I’ll need to make wand boxes for storage (or display – I plan a very nerdy curiosity cabinet with “souvenirs” from books and films I like), with the Ollivander label on them, of course. Wow, these are so beautiful! 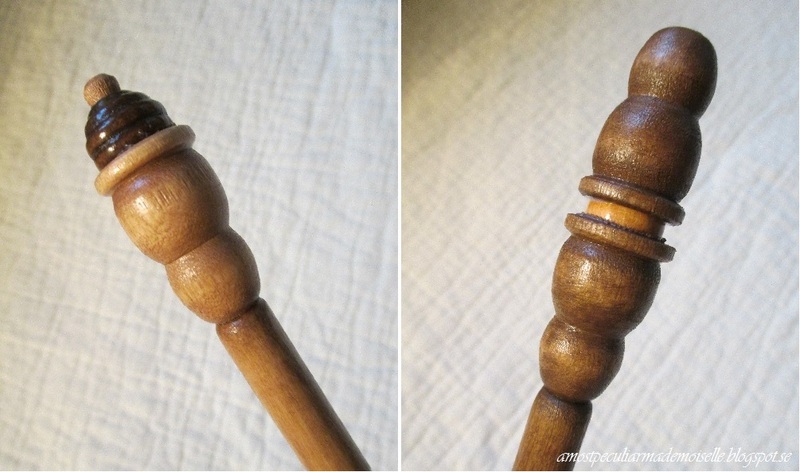 I want to make a wand now! Jag är ytterst avundsjuk! De är verkligen urfina. Den talangfulle kan verkligen förvandla vad som helst till konst. Jag säger bara, dina händer och dina ögon åstadkomma helt fantastiska saker.